I think everyone knows this round columns can be used for advertising. Formerly they were very common, nowadays they are becoming increasingly rare... a good reason to find and waymark them. What do you think about it? These things are all over major US cities -- I have seen them becoming more prevalent rather than more rare. There may be an overprevalence issue with this idea if every one can be waymarked. In Dallas there can be 2-3 per city block downtown. You are very lucky. 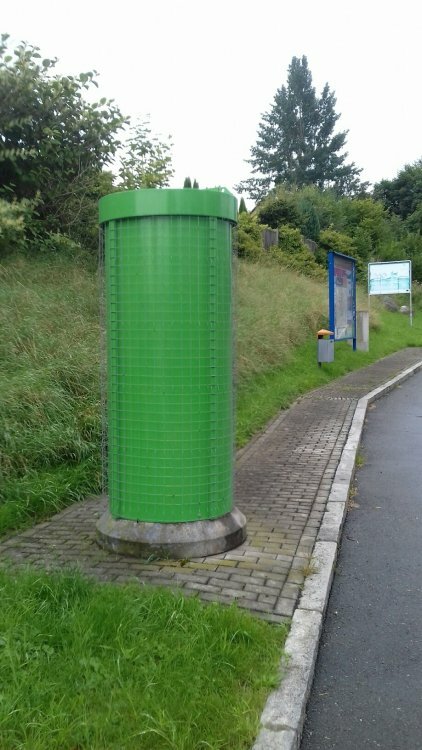 In the little town, where I live, there is only one Litfaßsäule. I know, in big cities there are more than in small cities or villages. Are these columns are all "Litfaßsäulen"? Not every column is meant here. Examples are in the pictures above. I think it's a great idea for a new category. This immediately reminds me of my childhood. Since this medium was even more intensively used for advertising and we occasionally made fun of the people who were pictured on the advertising posters. Unfortunately, they are not as frequent as they used to be. For me alone this is an aspect to the advertising columns pay tribute. In modern times, there must be space and memory for such old media. Great idea. Have seen them in many countries although I don't think thT there are any in Bahrain that I'm aware of. If this category goes ahead, it will need limits concerning proximity. Within five blocks of my current location, there are over 100. I searched your link with the location US and waited over 10 minutes for the result/s and nothing showed up to view. Canada was not on the list. Do you have examples for North America? I think there could be an overprevalence issue here, and are these interesting? A category for just all advertising columns might be overprevalent and not very interesting. On the other hand, I do like these original 19th century columns. They are most probably underprevalent and not global enough. Is there a way in between? I have't seen hundrets in only 5 blocks. In my region there are more heritage listed houses (10 in one short street) or Coat of arms (10 on one building) than advertising columns. 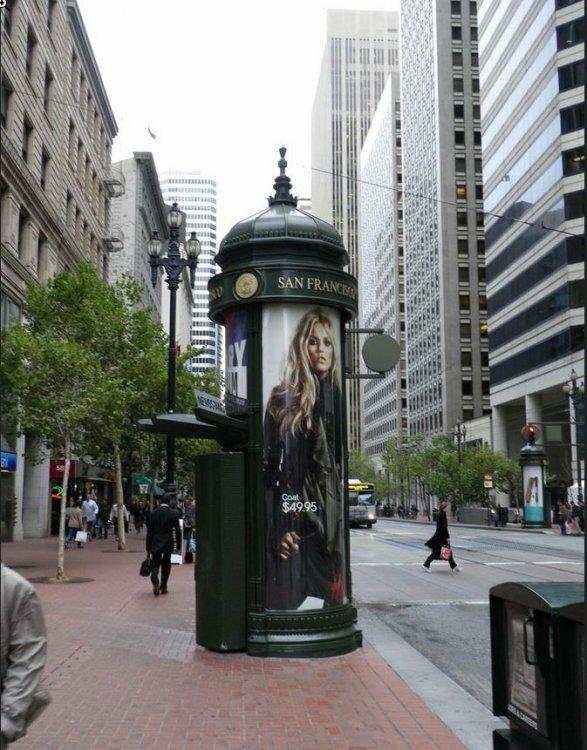 Columns that can be used for temporal changed advertisements, often as posters. The shape is a column with a roof, between 1m and 2m in diameter, and a height between 2 and 3m. The columns is fixed on the bottom, mostly with a concrete base. No movable columns are allowed. "... and are these interesting?" That's a good question. This question I ask myself here with so many already existing category! In comparison to other categories, the advertising columns can look back on a past two centuries and were the foundations of today's advertising. Of course, like other things on the globe, they occur in varying frequency, and they do not always meet with the same interest. But the problem finally arises in all aspects of Waymarking. As mentioned in my first post to this thread, I find that the advertisign columns with their history have earned a chance. I have always asked myself why there is still no category for these. Maybe there are a lot of not so interesting ones, those simple plastered without a base and a roof, but it would be nice to waymark the unique columns and those with historic significance. It will be not easy to distinguish interesting and simple columns, not for the guys which want to post and not for the officers. Cause this my suggestion is to allow this category in the way it is described currently. Maybe there are areas with a lot of them, but in the area where i live that's not the case. In little villages here you will find none, in middle sized towns a very view and in the citys some more, often very old ones. So from my side: Yes, good idea ! What in my opinion is synonymous for this category is the fact that it should be very difficult to find yet another category, where the advertising columns could be additionally accommodated (in contrast to churches, bridges, etc.). Possibly in "News Article Locations" ... when it is reported. so they should exist worldwide... Could you give examples of these columns in Australia, please? I searched Central Railway Station, Sydney & Flinders Street Station in Melbourne (based on the Singaporean example) but only found electronic billboards. Searched The Rocks, an historic area in Sydney, but couldn't find any there. Haven't seen such things here. When I searched "circular advertising columns in australia" I got some fine examples, in Paris. They seem to be quite common there. One was a combination toilet/advert column so perhaps you could overcome the prevalence problem by limiting them to this type. This one is probably not that old, but interesting, no? Two of the four examples above incorporate WC's so my suggestion has merit. The columns are fixed on the bottom, mostly with a concrete base. No movable columns are allowed. Columns that can be used for temporal changed advertisements, often (or only?) as posters. Only one column in a radius of 1 (2;3; 5 etc. ) kilometres (miles). How advertising columns helped people to ‘read’ a city’s identity. I like the idea of limiting the Waymarking to one column with a certain radius. However, I seek some advice on which column to choose to represent the limited area. I see the limitation of the number of advertising columns within a certain radius somewhat skeptical. At least he should not be too big, because this makes the whole Thing very complicated in my eyes. On the other hand, I do not see such limitations in a category like the "Coats of arms"! In Germany there are mostly signs on all town entrances, because of the town partnerships, on which the corresponding cities with their coat of arms are depicted. For example: For my hometown Andernach there are 7 different coats of arms on one of these shields, all of which are entitled to publish their own Waymark. The same applies to objects in the "German Monument Registers" section. Here is usually also in certain streets or centers one house next to the other. Just trying to overcome the prevalence issue, in Europe at least. No need to peek inside. Your example in Melbourne was described as: I wonder if anybody will notice posters like these which are rather unceremoniously pasted onto a column. Most of them were downright tacky and the way they are certainly an eyesore in an otherwise beautiful city. The posters are also pretty self serving and look more like notices with information on them rather than serious attempts to reach the public. Not seen as an advertising column. If this is an example then hopefully there won't be anymore. Where did your statement, Advertising columns are the oldest form of advertising in the world, come from? The History of Advertising, Wikipedia doesn't agree. That´s the authors point of view and depends on perception, taste and attitudes... posters are "eyesore", but plastic 3D flowers are "nice and elegant"... well that´s not my opinion. So for ME, the column in Melbourne IS an advertising column, maybe in another form how you understand these columns. Heute mal die einzige Litfaßsäule von Helmbrechts heimgesucht. Sie steht unbeklebt da... Ich finde solche vermeintlichen Werbeträger sollten n i c h t beispielgebend sein. Also: Rein in den MÜLL . That would take care of proximity concerns, only naked advertising columns are allowed. If it's not got ads on it, how will we know it is an advertising column? It could be a official government public notification kiosk or a piece of abstract art instead. The english article is really poor and not intersting. 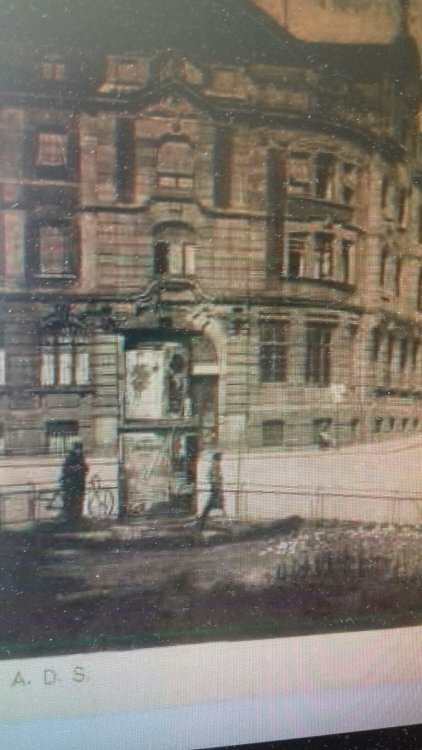 Auf historischer Postkarte gesehen: Der Bildausschnitt zeigt eine Litfaßsäule in Hof/Saale am Oberen Tor. Danke an CADS11 für den Tip! Schönen Sonntag Euch noch und stöbert ein bissl! In the group, we discussed this topic and also in the forum. Advertising columns or Morris columns (French: colonne Morris, German: Litfaßsäule) are cylindrical outdoor sidewalk structures with a characteristic style that are used for advertising. They are common in the city of Berlin, Germany, where the first 100 columns were installed in 1855. 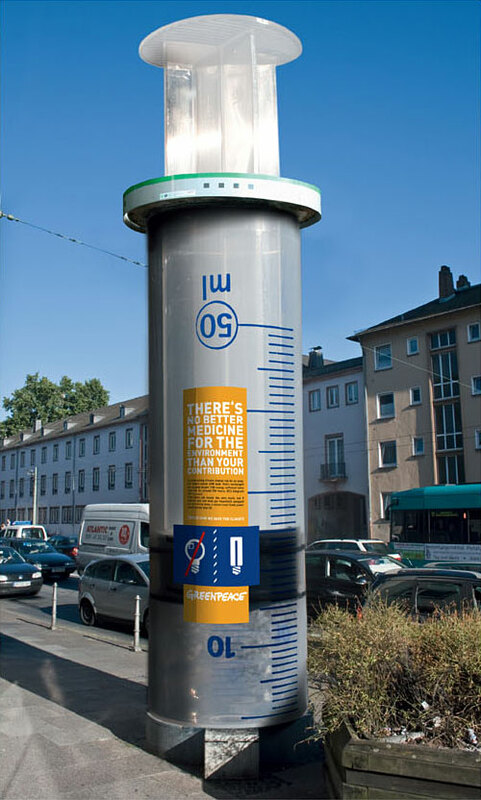 Advertising columns were invented by the German printer Ernst Litfaß in 1854. 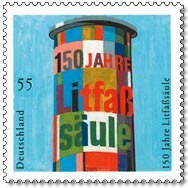 Therefore, they are known as Litfaßsäulen (Litfaß columns). In France, the columns are named Morris after Gabriel Morris, a printer, who held the concession for advertising in 1868. They were originally built by La Société Fermière des Colonnes Morris. Today, they are mostly built and maintained by the JCDecaux company, which purchased the original company in 1986. 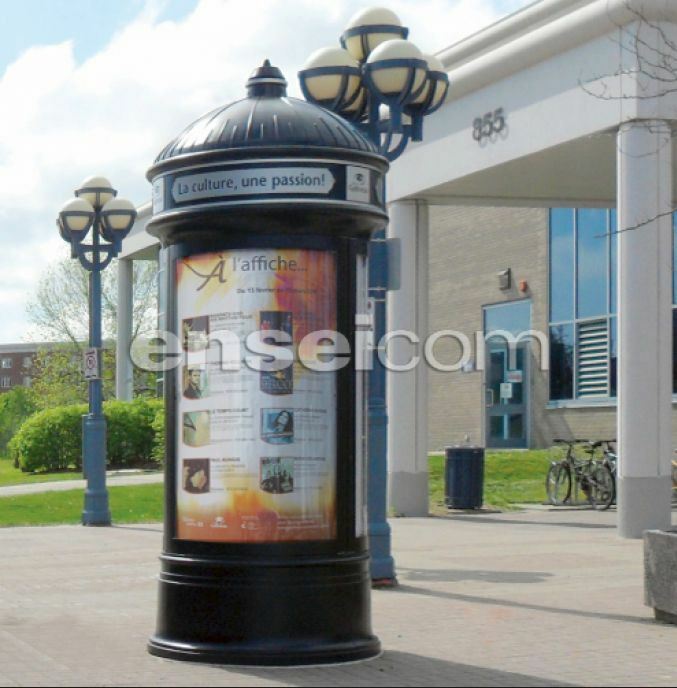 Advertising columns are most typically used to display advertisements in the form of posters; many such advertisements have traditionally concerned theater, cinema, nightclub, and concert announcements. Some are motorised and rotate very slowly. A few Advertising columns house Sanisettes/toilets or telephone booths. These advertising columns are one of the oldest form of advertising in the world and some of the oldest ones are heritage listed. The Third Man, Harry Lime (played by Orson Welles) uses one of these columns as an escape route to the sewer system under Vienna. In the movie Gremlins 2, Billy Peltzer (played by Zach Galligan) and Daniel Clamp (played by John Glover), use one of these columns as an escape route from the Gremlin infested Clamp Building. In the movie Men in Black II, Agent K (played by Tommy Lee Jones) and Agent J (played by Will Smith), use a column as an escape route from an alien infested MiB Headquarters. 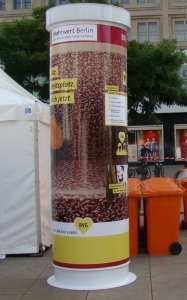 Columns that can be used for temporary advertisements, often displayed as posters. The column is fixed on the bottom, mostly with a concrete base. No movable columns are allowed. If columns are standing close together, only one column can be waymarked. COORDINATES must be obtained by a personal visit to the site and should be taken at the column. PHOTOS: Please provide two photos, one close up photo of the column and one photo which shows the column in its surroundings. 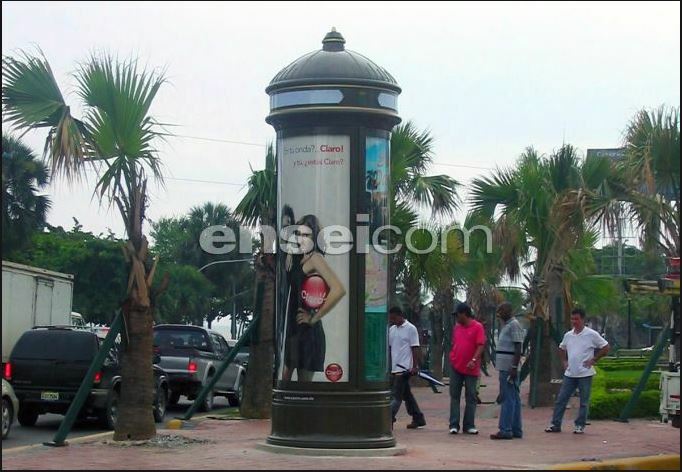 DESCRIPTION: Please describe the shape of the advertising column and explain, if it has something special or significant about it. Also discribe a minimum of one of the advertisements posted on the column (if already available), and explain what it is. A long description is required. NAMING CONVENTION: The name of the waymark MUST follow this format: Name of the place or name of the street – City - State/Province - Country. LANGUAGE NOTE: We recognize Waymarking as a global hobby and welcome waymarks from all countries. All waymarks must have a long description section in ENGLISH. We encourage bilingual and multilingual waymarks. This is an enormous Pritt Stick and not a column for changable advertisments therefore unacceptable. 1. The waymark coordinates must be personally visited. 2. Give the date and a description of your visit. 3. Post at least one photo taken at the time of your visit. We hope, everything is understandable and the language is correct. My only comment on this otherwise very well written proposed category write up is to more precisely define how close is "too close" to waymark a series of advertising columns on a city street. how close is "too close" to waymark a series of advertising columns on a city street. That is exactly, what we discussed hardly. You and elyob are the only waymarkers who mentioned the problem of “Within five blocks of my current location, there are over 100”. I don’t know, which town elyob thinks of, you are thinking of Dallas. We do not have that problem in Germany and in France. Also the Swiss and the Austrian waymarkers did not mention it. You can say, only 1 column in a circle of 100m, but 100m seems not a great distance for an American town. In a German old town, that distance can include half a dozen blocks. I see not a problem, if 2 columns are several blocks away. I looked for other categories, which has restrictions in distance. I only know one. Please tell me, if there are more. In the Coin-Op Binoculars category is written: „For locations that have multiple Coin-Op Binoculars you may submit one listing per area. During review if the "Proximity Alert" goes off you will likely be told the area has already be claimed.“ Here you find no exact definition. Perhaps you have a better solution, that solves your problem without building a new problem in another part of the world. We think, only one on a city center place, only one in front of the railway station, when there is one at the left and one at the right entrance. I am near Ottawa, the capital of Canada, where there are many columns, mostly for advertising things that visitors can do. If the group does not think there would be too many columns in Paris, then Ottawa-Gatineau should be okay too. In the early days, I might be the only one creating local waymarks. If the category description does not specifically limit the distance, I will respect the proximity alert when creating a post. 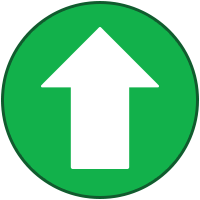 Check the co-ordinates of your location against previously submitted Waymarks in your area to determine if the same cover hasn't already been listed within a 1 mile - 1.6 kilometre distance. I think it will be difficult to give a distance, the proximity alert and the quality of the column can be enought for approval. I think that for now we can put aside this distance story and see as publications go if we have to change that. Otherwise the category is perfectly written, and I think it will please a majority of us. Look at Artistically Decorated Utility Boxes. It has no restrictions on proximity. We have seen quite a few streets on which one may find a decorated utility box on each corner and more boxes a half block off the street in each direction. A one hour walk could easily net one 30 or more utility boxes. No restriction on proximity seems to be working for them, it may work for you. Thanks Alfouine, for that information. There was no restriction, when I posted a waymark in that category. 1 mile means an area of 8km², that is more than the city center of Bonn, former capital of Germany. This group wants only 1 cover per city. I think, that is the death of this category. Thanks, I will never look for a cover again. If government controls the temporary advertising by placing it under locked, transparent covers; does the column still qualify? If you can see the advertisment (transparent) yes. When this idea came up first, I thought 'No, I think we don't need this'. But now, after the discussion and after reading the good category description, I will change my oppinion. It looks good to me. I will support it with a 'yea' at Peer Review. I see no problem with any distance between the colomns. Nowadays there are not too many of them out on the steets. I know those coulmns since decades and many of them have been lost. What is the best headline for that catagory in the Category Master List? History ? Not for the newer ones. What is your opinion? I have an idea, but we like to hear / read your opinions. Structures sounds good to me.